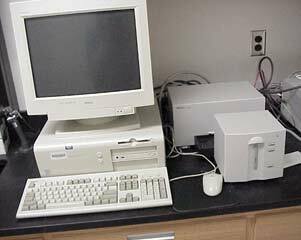 Practical Aspects of UV-Vis spectroscopy or "How to get a good UV-VIS spectrum"
The UV-Vis instrument (HP 8453) used in Chem 30BL/CL is located in YH 1102 and YH 6076. 1. In order to acquire a UV-Vis spectrum, the solid has to be completely dissolved in a suitable solvent. Note that not every solvent is suitable for UV-Vis spectroscopy. Generally, spectrograde solvents are used that have undergone special purification steps to remove trace impurities of aromatic and other compounds (see link below for solvent cutoffs). For instance, 95 % ethanol is generally not suitable as solvent for UV-Vis measurements because it often contains aromatic compounds as denaturing agents. 2. Cuvettes also have limited optical windows. While cuvettes made from fused quartz allow measurements as far down as ~200 nm, Pyrex cuvettes already show a significant absorption around 260 nm. 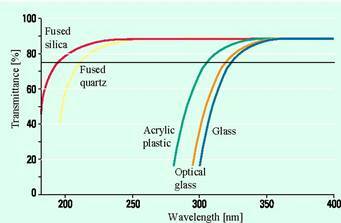 Cuvettes made from acrylic plastic or ordinary glass absorb already at higher wavelengths. In addition, many of the plastic cuvettes are not compatible with most organic solvents (the windows are not translucent anymore or they are plainly dissolved, for details see link below). If you use a quartz cuvette, please keep in mind that it is very expensive (~$150 each). If you break it, you will have to pay for it since your lab material fee does not cover this kind of loss. So be careful when you handle them. 3. Since UV-Vis spectroscopy is an absorption technique, Beer's Law can be applied. It is only valid at low concentrations (<10-4 mol/L). At higher concentrations, a negative deviation is observed due to association of the molecules and other effects. Another critical factor is the detector of the UV-Vis instrument that only works linear within a certain range as well. A meaningful absorbance reading should be between A=0.1 and A=1.0. In essence, the concentration has to be low enough, so that the maximum absorbance does not exceed A=1. And yes, you do need to know the exact concentration of your sample in order to determine the molar extinction coefficient (e). Just preparing a solution that gives you a good reading is not enough to obtain all thr relevant information (l and e-value!). In the lab, prepare a solution of the compound (based on the given extinction coefficients above) in a graduated cylinder. Fill the cuvette about 3/4 with the solution. 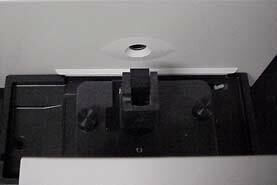 Then place the cuvette in the holder shown in figure 2 (front: detector, back: light sources). At this point, the TA usually acquired the background spectrum already. Make sure that the instrument is turned on. It has to warm up for 20-30 minutes. Start the program by double clicking the "Chemstation icon" icon on the desktop. Skip the request for a admininstrator password. Go to the "FILE LOAD METHOD" option and load the method "130AL". The software tested if the instrument is working properly. Pour the solvent in the cuvette and then click on the "BLANK ICON" to acquire the spectrum of the solvent. The solvent spectrum should be relatively flat, except in the lower range due to the absorption of water in the air. Place the cuvette in the holder. Then click on the "SAMPLE ICON". The instrument will acquire the spectrum of the solution. The method will automatically assign some peaks and valleys. You can print the spectrum by using the "FILE PRINT CURRENT SCREEN". Make sure that the maximum absorbance of your sample is around A~1 and that you print the entire range.